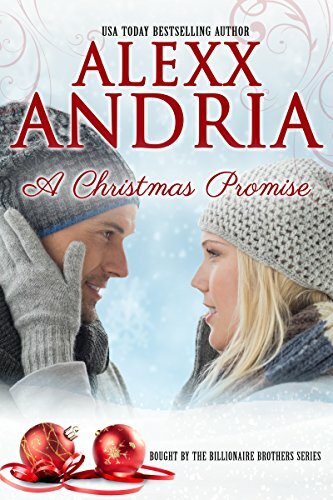 ﻿ Download "A Christmas Promise (Billionaire romance) (Bought By The Billionaire Brothers Book 9)" by Alexx Andria for FREE! All the wealth and privilege in the world cannot erase the memory of one woman.­Laird Tiechert doesn't do "forever.­" The son of a construction magnate, he spends his time perfecting the art of perpetual bachelorhood. That is, until several months ago, Lana Winters was thrust into his care . Broken, damaged and needing someone she could trust, Laird found himself in a role he'd never played — as a caregiver. Laird told himself he was playing a part for the sake of protecting the club, Malvagio. When his part was done, he walked away. Except, Lana never truly left his heart. Lana Winters, still struggling to overcome what'd happened to her in the darkened halls of the notorious club owned by the Buchanan family, wants nothing to do with men or relationships...­especially someone like Laird. “Harsh.­” He frowned. “What if I told you I hadn’t lied about a thing I shared with you and that was the reason I ran away?­” Okay, so he was going with honesty after all. He glanced down to gauge her reaction. “Cat got your tongue?­” he teased when she failed to offer a sharp quip. “Pity. We make parties far more interesting,­” he said with a lazy drawl as he twirled her in his arms. Startled by the sudden motion, she clung to him, her eyes darting. Her cheeks, bright and rosy, only drew more attention to the sparkling loveliness she radiated, whether she liked it or not. Given the fact that the last time he saw her, she’d purposefully downplayed her good looks and he, being the unobservant clod he apparently was, had bought her act hook, line and sinker, he wondered if it wasn’t his duty to help coax her out of her shell.